Out of all the summer/superhero movies I’ve seen so far (as of now, four), this might be my favorite. But again, that’s so far. This has been one of the more satisfying of all the X-Men movies so far too. When I go to see a movie about the X-Men, I want to see super powers galore! I got my wish with this one. I also got a great story in the process. After reading several notes from the director and filmmakers and actors, I’ve learned that this isn’t just a prequel, but more of a reboot of the X-Men franchise. Call it what you will, this will still live on and be the 5th film in the series to me. It seems to fit for me anyway. In fact, I actually want to re-watch X-Men Origins: Wolverine just for continuity’s sake. Just for my own curiosity. But the director told the actors to forget about the originators of their roles and to be their own version of that character. In a way, you’d almost kinda have to considering this story talks about the young versions of these characters. And the characters mostly featured are Professor Xavier, Magneto and Mystique. These are the “code names” I’m going by. There are more mutants introduced, some of which I hadn’t been too familiar with but weren’t lame either. Like the main bad guy: Shaw. He was definitely a force to be reckoned with, played by Kevin Bacon… which makes it so much easier to play Six Degrees now. Shaw has the power to harness energy and then use it against you. But I didn’t realize he was a mutant until much later in the film. Oh yeah, I didn’t have very high hopes for this movie. I had my doubts from the start that this would be enjoyable in the least, and I’m glad I went in with such little aspirations. I mean, it had changed over the weekend before I actually saw it and read how well it was doing in the box office and what critics had to say. So the story is about how young Xavier and his adopted sister Mystique cope with trying to be normal in the real world in the 60’s. Xavier has it easier since being a telepath doesn’t not being blue. And being the young version, he has hair and walking. Just thought I’d mention it. We also meet young Magneto who is on a mission of vengeance to kill those responsible for what happened to him and his family in Poland during Nazi occupation. Who is at the top of the list? Shaw. And who is about to try and start WWIII and is behind the scenes of the Cold War? Shaw. Who gets recruited to help bring down Shaw? Xavier and Magneto. They actually go off and recruit members to help them equal the fight and form what will later be called X-Men. I watched the X-Men cartoons as a kid, so I think I liked them most. Maybe Batman cartoons too. But I loved seeing them use their powers. This movie gave them plenty of opportunities for them to “flex their muscles” and they used them. There’s a scene where the new recruits show off to each other, then another scene when they train, then more scenes in battle! Special effects heaven. But let’s not forget there’s a story to tell. We want to know how they got started, why they banded together in the first place, and why they split. It’s always been known or at least hinted that Magneto and Xavier were once friends. Or maybe a better term would be “frenemies”? But they were actually friends at one point. And I liked the comparison of MLK and Malcolm X. One wanted peace and equality, while the other felt it would never happen… in so many words. The other thing this movie did was set up the story, or the mythology, of the X-Men universe that fans know and love. Sure, some characters were moved around for the sake of story, but that always happens. I wasn’t complaining. And you know what, there were some cameos in there. One in which I’ll keep secret… until the very end of this post. The other cameo is a young Storm, which I didn’t catch at first. But what this movie did make me do was research when I got home who was who. I didn’t do my job and stay until the very end, but I loved the end title sequence. So I can’t definitively say there are or aren’t any extra scenes. But I think it’s worth checking out while it’s still in theaters. I really felt entertained with this one and would see it again. 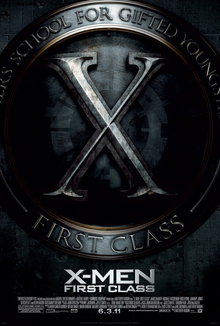 The cameo mentioned above takes place while Magneto and Xavier are recruiting mutants, and they happen upon Hugh Jackman’s Wolverine in a bar with one line that can only be said once in a PG-13 movie.